CLIME Connections: NCTM conference Preview: An endangered technology principle watch? NCTM conference Preview: An endangered technology principle watch? In the “good old days” (post 1980s) NCTM had technology strands and computer lab sessions at their annual conferences. But the strands don’t exist anymore and the labs were gone as of 2007. And to make matters worse the NCTM Board of Directors in 2008 responded to a resolution that would increase opportunities for speakers to have better technology support (that passed unanimously at the Delegate Assembly) by turning it down. (Here’s my blog response.) 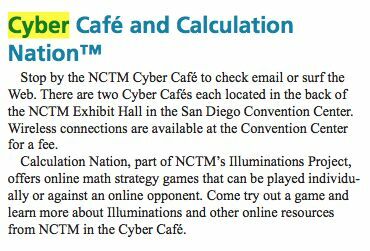 So it appears to me that the average attendee at this month’s San Diego event will need to make a concerted effort to find examples of how technology is transforming the way we teach and learn math today. This is particularly egregious since the 2000 Standards declared that technology was a principle right up there with teaching, learning, assessing, curriculum and equity. (See link.) Though my optimism that NCTM would promote technology as a platform for the other principles has waned I've found a renewed spirit in realizing that we the people and groups like ours can make that message heard by collectively taking advantage of current and emerging networking technologies. 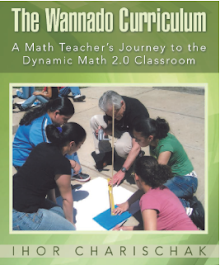 Since CLIME’s focus as an affiliate of NCTM is to champion the vision that these technologies can do to promote math education we should step up and lead the charge towards the kind of reform that builds on the power of Web 2.0 and dynamic math tools to help transform math education. So we’re eager to get the ball rolling once again this year. For starters we created a website that lists 130* technology related math sessions at the upcoming conference (link.) 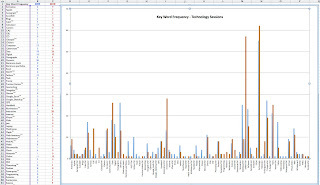 To determine which sessions made the cut I did a tag frequency analysis of the words used in the titles and descriptions of the talks. 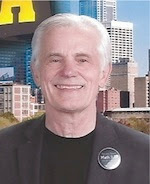 I also compared it to last year’s results (See CLIME Blog entry – April, 2009). Here is a spreadsheet graphic of my results. Overall the percentage of sessions (134 out of 770) is about 17% which is slightly above the average for the annual meetings over the years. Last year it was 14.5% and in 2008 16%. Very few references to Web 2.0 tools. Not unexpected given the Board's (and program committee's) lack of general support for technology. I’ll have more to say about this in my next blog entry. You can download all or parts of the conference program book here. Will the conference be Web 2.0 friendly? At the Convention Center it will cost you $12.95 per day to connect. If you brought your laptop (or iPad etc.) you can follow CLIME’s shenanigans via Twitter using the hash tags #clime and #math20 and the conference in general with #nctm10. NCTM has a conference blog going on as well. I’ll be one of the NCTM’s contributing bloggers sharing the goings on at Booth #230 during our “Unconference within a Conference” Math 2.0** activities at the booth on Thursday and Friday. (And maybe even on Saturday, if we still have a pulse.) More details about the Unconference in my next blog. Also more about our CLIME session #351 at the NCSM conference on Wednesday, April 21. If you won’t be carrying any device that will connect you to the Internet you can always head over to the CyberCafe to check email etc. While you are there you can also explore their cool collaborative game initiative: Calculation Nation. ** For more about Math 2.0 see my blog entries: "In Search of Math 2.0" and "Math 2.0 – Making a Virtual Splash in San Diego?" Why is CLIME not CTIME?